Evolve Vacation Rentals Network, Denver. Photo © Franck Ooms. 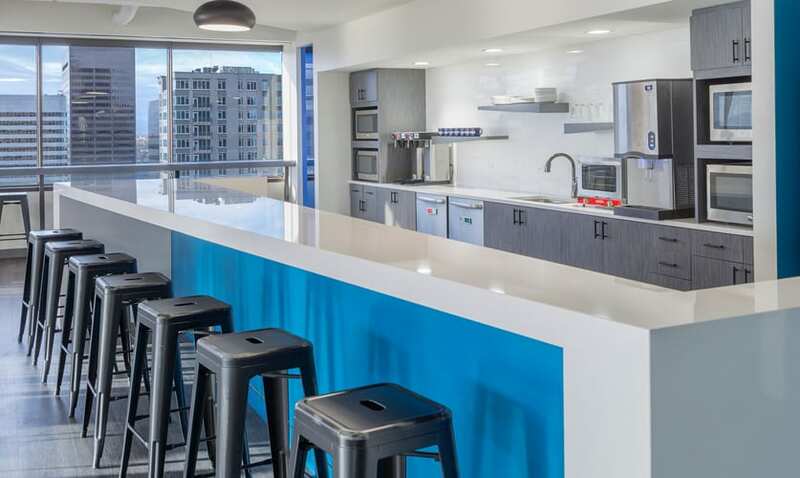 Successful startup Evolve Vacation Rental Network, having outgrown its space, wanted to consolidate its leases and bring staff together in a single Denver location with plenty of potential for growth. The goal was an engaging environment where they could thrive as they grow and maintain their sense of community and culture—relaxed, casual, but focused. They identified and leased two adjacent floors that were not connected. Initially, the second floor would only be partially occupied. That meant the layout and design of the full floor would need to be carefully planned and continued onto the second floor for a seamless expansion as new staff came on board. 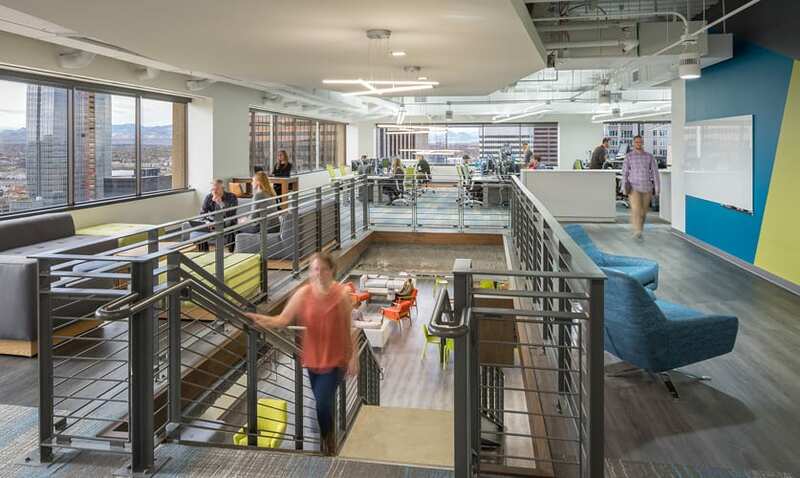 In addition, IA suggested and designed an open stair next to the break area to encourage community, easy movement between the two floors, and use of the adjacent collaboration spaces on both floors. The break area next to the stair offers a variety of seating and the best views of the Rocky Mountains to be enjoyed by all. A large adjacent conference room has glass retractable doors that open to the break area for all-hands meetings and group events. 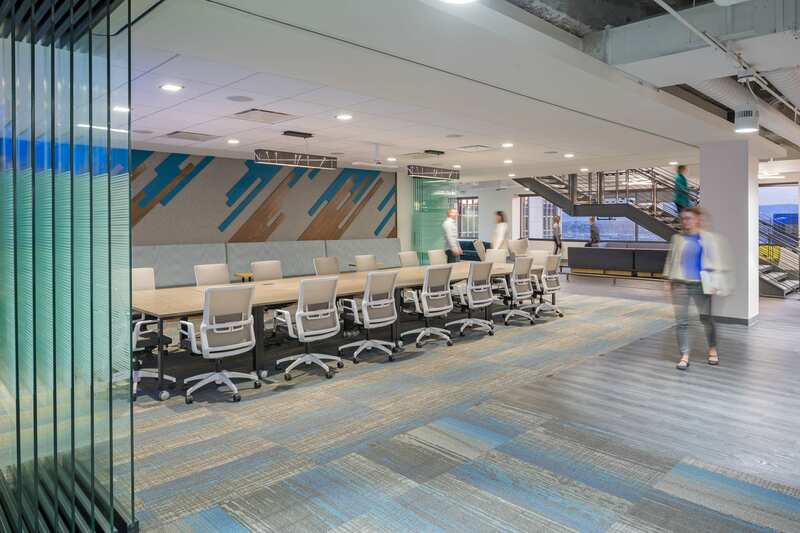 Private offices, with glass sidelights that allow the inflow of natural light, as well as conference rooms, are at the interior, with benching stations along the perimeter. 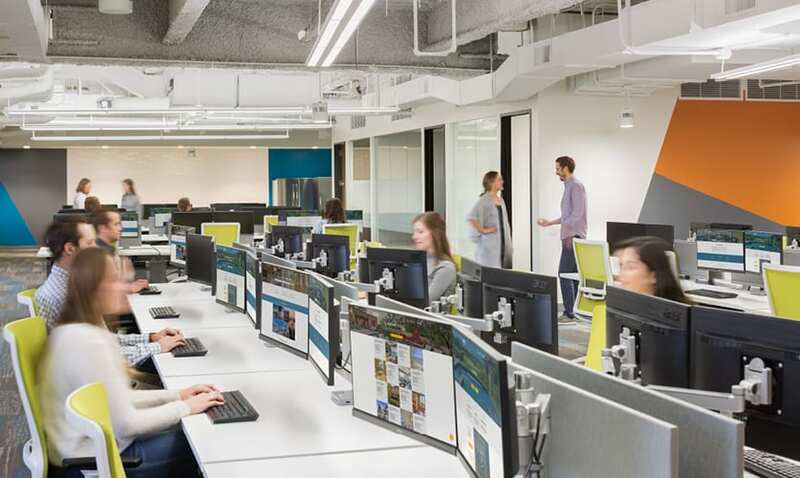 The open plan offers height adjustable workstations and a combination of open and enclosed work spaces for variety, convenience, and choice. Office/huddle room pods effectively break up the space, and the ceiling is purposefully exposed to insure a not-too-corporate feel. The design effectively uses simple materials for economy and functionality. 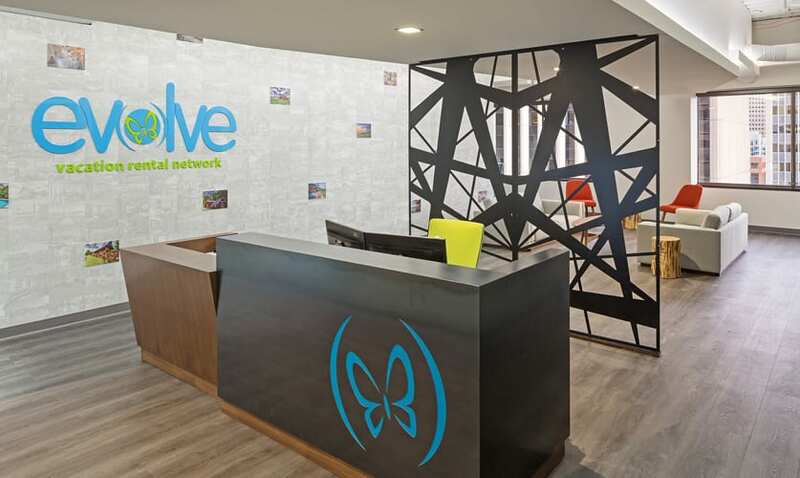 The Evolve logo includes a butterfly. The screen behind the reception desk displays an abstract version of butterfly wings. At the breakroom the shape of the custom pendant lights capture the wing shape in the logo. Since occupying the space about a year ago, Evolve has expanded fully onto the second floor. Then you'll probably appreciate our work with Applied Predictive Technologies. Creative use of interior, glass-partitioned meeting spaces, bold colors, designing to promote creativity: the ingredients are different, but the results are very comparable. Learn more below.